Usually dispatched onto Courier Transport within 24-36hrs. Transit time location dependent. 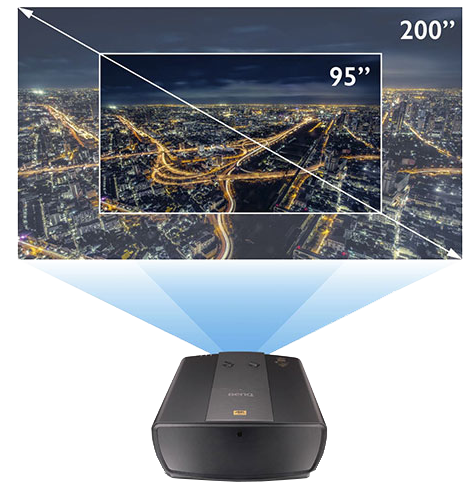 Precisely visualizing 8.3 million distinct pixels, BenQ LK970 4K Laser Projector brings together true 4K UHD detail and the power of maintenance-free BlueCore laser light source. Ideal for entertainment simulators and gallery exhibitions, LK970 generates supreme picture quality to reproduce true-to-life images for totally immersive experiences for audiences. 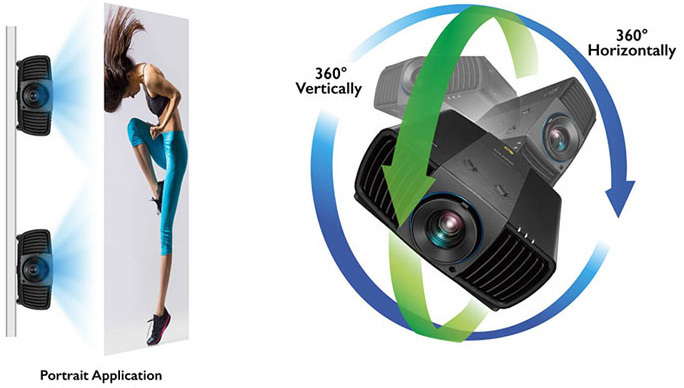 Offering up to 20,000 hours of perfect performance, LK970’s flexible installation features such as H/V lens shift, big zoom, 360° projection and portrait capability make it a versatile projector perfect for diverse venues. 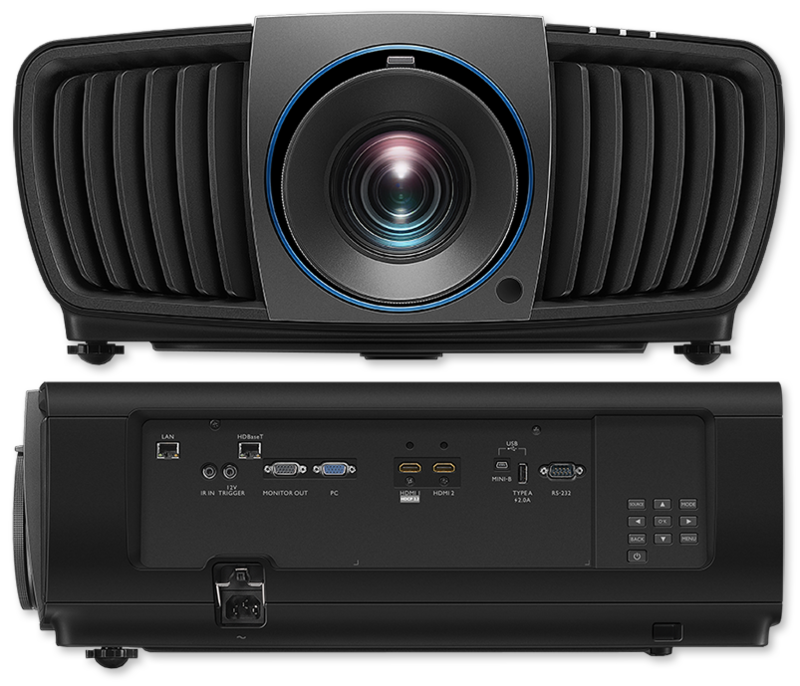 The world’s No.1 DLP brand BenQ augments its full line of revolutionary BlueCore laser projectors with LK970, unleashing true 4K UHD resolution for beautiful and innovative visual communication in public venues. Harnessing the advanced DLP 4K UHD DMD with 2716 x 1528 (4.15 million) micromirrors, LK970 achieves Consumer Technology Association's (CTA) 4K UHD specification via XPR fast-switching technology. Utilizing a dual-position precision optical actuator with state-of-the-art image processing, LK970 doubles the resolution to 8.3 million distinct pixels for each frame, four times the resolution of Full HD 1080p. The awe-inspiring 4K UHD image quality reduces blur between pixels to deliver supreme clarity and crisply defined details. LK970’s high-performance lens system employs sophisticated optical design to deliver true-to-life images with a high differential rate reflected through the 5.4 micrometer image resolution produced by the DMD. This innovative optical lens eliminates image distortion, achieving the best possible image clarity suitable for entertainment simulators and gallery exhibitions. LK970’s 4K-optimized lens system consists of a super-high resolution 16-element lens array structured into 8 groups. The lenses are made from the highest-grade all-glass substrates, with metal barrel and cell framework. The lens system comes with greater light penetration that guarantees long-lasting 4K intensity, breathtaking clarity, sharpness, and color performance across the entire screen. LK970’s 16 low dispersion lenses minimize chromatic aberration via a customized optical parameter and ultra-low reflective coating that prevent shape distortion while safeguarding perfect projection quality. The result is superbly delicate image quality that guarantees the best viewing experience. 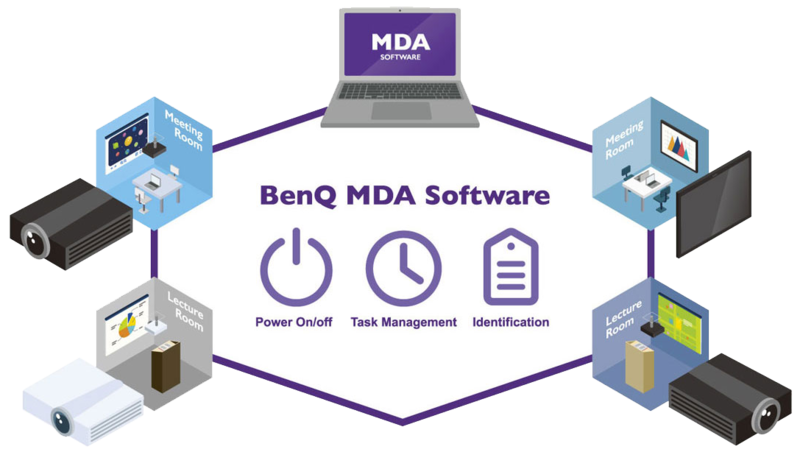 To avoid inherent alignment issues of multiple panels, BenQ LK970 4K Laser Projector preserves color and image integrity with single DMD DLP technology. Generating razor-sharp images and pure colors, LK970 eliminates problems such as blurriness, shadowing, and interference patterns for immaculate clarity. LK970’s powerful BlueCore laser projection utilizes a dual color wheel system to produce unparalleled color performance by increasing color ratios and purity of RGBY color, dramatically enhancing color saturation to ensure superior viewing experiences. To ensure the best image quality, BenQ's LK970 adopts the cutting-edge 4K Image Amplifying Technology to further enhance the quality of projected images. LK970 automatically upgrades the resolution of all projected images to 4K, guaranteeing superb image details. Additionally, LK970 also comes with Pixel Enhancer 4K, a motion-adaptive edge enhancement feature that detects changes in the color between an object and its background to produce sharp edges and precise surface textures. LK970 4K Laser Projector creates strikingly clear images with stratospherically high native contrast ratio of 100,000:1 for true deep blacks, vividly rich colors, and fine subtle details. LK970 also features spontaneous response, requiring no wait to turn on or resume from blanking in true black for flexible performance capability. BenQ laser projectors support continuous 24/7 operation and are suitable for public display applications in museums and exhibitions. Users can choose from three different light source modes to optimize energy use and extend the projector’s life up to 60,000 hours in Eco Mode. BenQ LK970 4K Laser Projector is designed with sealed laser modules and enclosed light engines to protect the DMD chip, color wheel sensor, laser bank, and other optical components. This lock-and-key design hermetically seals the engine from dust* to prolong projector lifespan. LK970 employs two advanced cooling systems to ensure optimal thermal conduction during operation. The circulatory liquid cooling system protects the laser light bank and DLP engine even after constant operation in ambient temperatures up to 40°C (104°F), while the heat pipe cooling system cools the DMD chip to effectively produce a comfortable sound with improved reliability. Additionally, LK970 also comes with several embedded thermal sensors to intuitively control the projector's temperature and ensure optimal operation. The sensors can detect the temperature of the laser-bank and surrounding environment in real-time and automatically adjust the speed of the fans. LK970’s intelligent High Altitude Mode enables efficient cooling to properly maintain operating temperatures in high altitude environments with reduced air pressure in thinner atmospheres. LK970’s wide zoom range, focus, and horizontal/vertical lens shift systems can perfectly align images in any challenging venue. 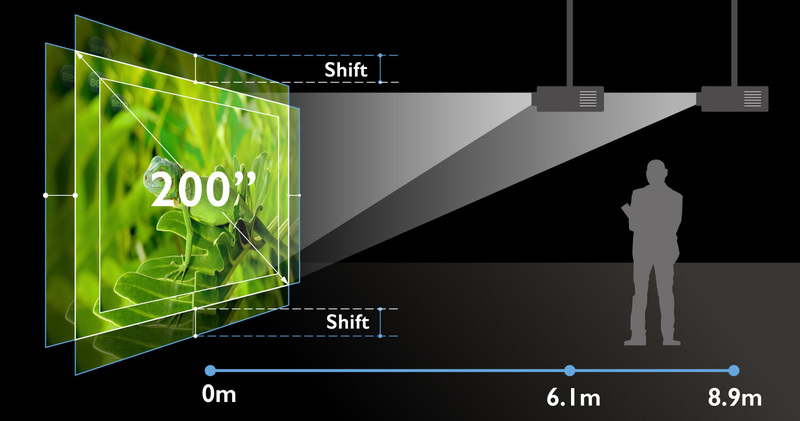 Lens shift can move projected images up and down by 60% of screen height or left and right by 25% of screen width without sacrificing image quality. The 1.5X big zoom feature offers a wide range of throw distances to significantly increase installation flexibility for diverse mounting options in various public display scenarios. LK970‘s True Zoom system adjusts automatically to follow focus adjustments, optimizing the zoom ratio to deliver visually perfect focus without blemish. The focusing lens groups adjust simultaneously with the zoom lens group to negate any curved field for immaculate cinematic performance and high-precision clarity at every corner of the image. LK970’s symmetrically centered lens design allows easy installation without the need for special considerations for offset installation. BenQ BlueCore Laser Projectors feature full direct control of laser light output, achieving true black in Blank Function to eliminate light intrusion and enable customized energy conservation. Full laser output control also enables spontaneous response, requiring no wait to turn on or resume from Blank Function. 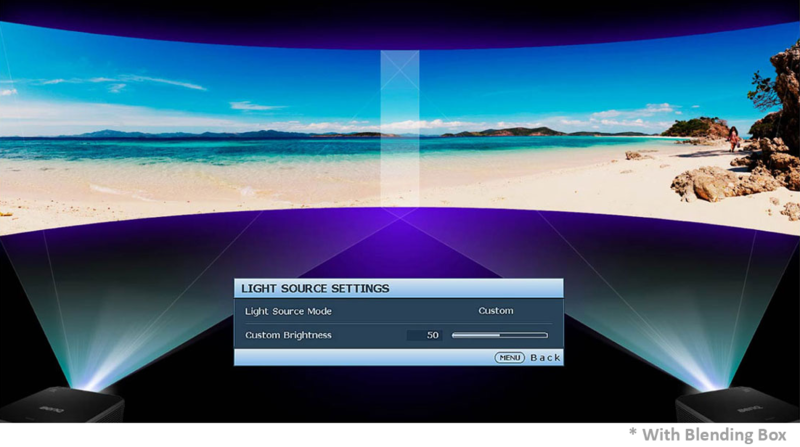 Custom Light Mode modulates light power output from 20% to 100% to optimize the projected image in a variety of ambient lighting situations, especially useful for blending consistent brightness across multiple projections. DICOM (Digital Imaging and Communication in Medicine) is a standard for handling, storing, printing, and transmitting medical imaging information. LK970’s DICOM Simulation Mode is ideal for viewing grayscale medical images, such as X-rays, with an advanced grayscale level for training and educational purposes. BenQ LK970 4K Laser Projector is compatible with Creston, AMX, and Extron control systems for convenient system integration with various third-party components and reduced the cost to centrally maintain multiple projectors. The groundbreaking HDBaseT connectivity combines video, audio and device control signals from multiple sources including PCs, laptops, document cameras, Blu-rays, and DVDs onto a single CAT5 cable for seamless long-distance transmissions up to 100 meters.The groundbreaking HDBaseT connectivity combines video, audio and device control signals from multiple sources including PCs, laptops, document cameras, Blu-rays, and DVDs onto a single CAT5 cable for seamless long-distance transmissions up to 100 meters. Adhering to strict European regulations, networked standby power consumption is cut down to a mere 2 watts to reduce environmental impact and total cost of ownership. When in Standby Mode, power consumption is a minuscule 0.5 watts.